"Our lives begin to end the day we become silent about things that matter." --Martin Luther King, Jr.
Beauty and the Beast-Stop the Racism! 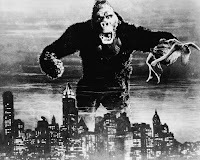 Brotherdoc realizes now what sort of “King” media sees LeBron James as: King Kong! The imagery here is not even subtle. James appears here as forceful energy—he is not depicted as contemplative, intelligent, or measured. He is Kong. He is clutching (“protecting”) the supermodel Gisele. She is his "Ann Darrow”/Fay Wray. I wonder if Gisele's boyfriend Tom Brady would have posed this way? BBC News reported that last month Nwabisa Ngcukana, a 25 year old female, was attacked by taxi drivers in South Africa because, according to the men, “she was indecently dressed”. The outfit that the men found so objectionable was a mini skirt. “Passers-by reportedly laughed and cheered” while Ms. Ngcukana was being assaulted. 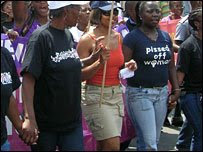 During the attack "some shouted that South African women were being given too many rights." Last Friday, Ms. Ngcukana returned to the location of the assault with other women to protest her treatment and to demonstrate “that women have rights - they have the right to choose what to wear". This attack and subsequent protest shows a widening division between South African women exercising their rights and the men’s unwillingness to accept those rights. 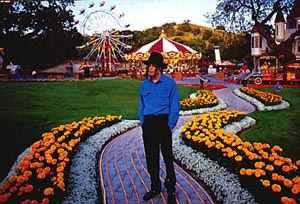 Michael Jackson Selling NeverLand Ranch? Brotherdoc just read that Michael Jackson is selling NeverLand Ranch. He is also having trouble paying the mortgage on the Jackson family mansion in Encino. I know the housing crisis has reached epidemic proportions. Thousands of people are losing their homes daily. But the King of Pop!! Times must be really tough when Mr. “Thriller” can’t make ends meet. I hope Mike doesn’t have to sell the Elephant Man’s bones because I know how dear they are to him. Bubbles the chimp may have to get a part-time job. Maybe he could go work for the UniverSoul Circus. I'm sure Zeke could find something for him to do. I should have known there was a problem years ago when Mike could only afford one glove. I guess all those child molestation settlements caught up with him. Mike, keep your head up, and if you need some spare change just let Brotherdoc know. We can put your picture on a cup at the local Zippy Mart and ask for donations. While watching the NFL combine on television today, an uneasy feeling came over me. The combine bares a strong resemblance to a slave auction. 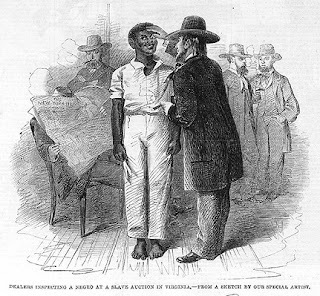 Watching (mostly) Black men in various stages of undress, run, jump and get measured by (mostly) White men, conjures up images of African slaves on the auction block. I understand that these young men stand to become multimillionaires depending on their draft positions, but swapping the cotton field for the football field does not change the relationship that these Black men will have with their wealthy White owners. The NFL combine is quite dehumanizing and more befitting a race horse or show dog rather than a Black man. Brotherdoc understands that this is not much, but at least it is a first step. Tavis Smiley is upset at Sen. Barack Obama because Obama did not attend Smiley’s State of the Black Union meeting held in New Orleans. Smiley has used The Tom Joyner Morning Show to put Obama on blast for not giving Smiley (though not the meeting) due reverence. Obama had campaign appearances that he could not reschedule to attend Smiley’s event. Brotherdoc could be wrong, but campaigning for President of the United States may be just a tad bit more important at this particular moment. Brotherdoc understands how important the State of the Black Union is to Smiley, and to Black people. But attacking Obama for not attending is entirely inappropriate. I am disappointed in Tavis Smiley especially since I once held him in such high esteem for his work on BET, NPR and his nightly talk show. Smiley’s criticisms of Obama strike me as childish, and self-serving. Obama sent Smiley a letter expressing his regret for a tight schedule. Obama even offered to have his wife, Michelle Obama, represent him. But even a future first lady was not good enough for Smiley. Smiley has made it clear that it was either his way or no way at all. Smiley has spent the last several months hating on Obama. So much so that one wonders if Smiley thinks that he is the voice of Black America. For all his hating, Smiley has been flooded with protest. Smiley says he has even received death threats against his family. I do not agree with the threats against people’s lives. I do, however, find it refreshing that so many people have taken Smiley to task, while also voicing their support for Obama. As for Smiley, Brotherdoc does not see that much has changed since last year’s State of the Black Union meeting. If Obama is not elected President, I do not think that much will change for the better before next year’s State of the Black Union meeting either. So Tavis, please chill on the hating!! While reading the Washington Post today, I came across a very interesting article by Rick Weiss entitled, “Their Deepest, Darkest Discovery.” The first line of the article read, “Black is getting Blacker.” Of course this piqued my interest because Brotherdoc is always looking for thoughtful discussions on blackness. Apparently, scientists have created something that they are calling "Super Black", which “is a paper-thin material that absorbs 99.955 percent of the light that hits it”. According to the story, if your body is covered with this “blackness,” you become invisible. Brotherdoc is not sure how much money or time was spent on this "creation", but I could have told them that for free. In fact Ralph Ellison wrote about this invisibility caused by “blackness” over 50 years ago. Brotherdoc: So, what is "Super Black"? Brotherdoc: I see. So, once you go Black you never come back! Scientist Gerald Fraser: “ The more black the material the better”. Brotherdoc: Um hmmm. My momma always told me, the blacker the berry the sweeter the juice. Brotherdoc: Oh, so what are you saying!? You don’t deliver to those neighborhoods? Brotherdoc: Gotcha. Faint stars taking up blackness like Pat Boone, Elvis Pressley, Justin Timberlake, Vanilla Ice, and Alan Thicke’s kid. Guys before you do any more studies about “blackness,” please give Brotherdoc a call, I can save you a lot of time and money. Brotherdoc is happily married to Sisterdoc.